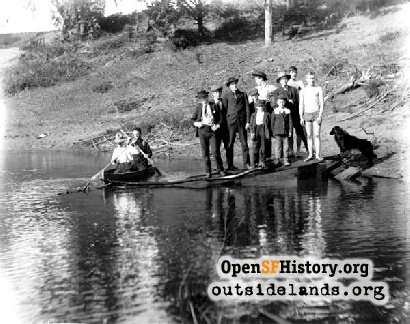 Recalling an icy childhood adventure on Pine Lake. 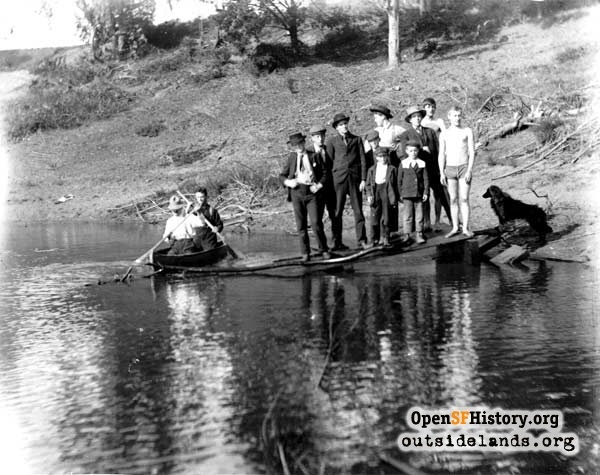 Boys boating and a dog posing at Pine Lake, often called Mud or Pig Lake., n.d. - Courtesy of a private collector. They (whoever "they" are) say your life passes through your mind in instant replay when death closes in. I was only 11 when my watery near-death experience happened, so I didn't have much of a life to replay. Besides, anything with "play" in it would be the wrong word. I was too busy fighting to stay alive in ice-covered Pine Lake, where the WNP holds its October picnic. Today the lake is a perfect spot to gather and exchange stories about the past. A well-maintained trail surrounds the valley lake, making it easy for visitors to take their time meandering around the water, spying on the fowl and smelling whatever flowers are in bloom. 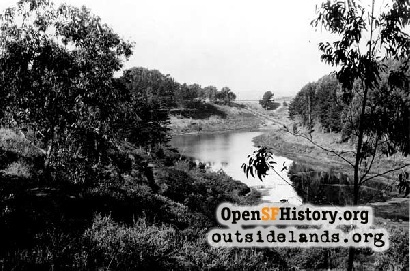 In the late 1940s, however, the lake was a muddy water hole encircled by trees and sheer hillsides, and, on my day of reckoning, imprisoned by thick ice. At least I thought it was thick when I fell in. A year or so ago I paid my first visit to Pine Lake in more than 50 years, walking around the lake during a break in a concert at adjacent Stern Grove. The memories, to use an appropriate cliché, came flooding back. I lived 25 blocks from the lake in the post World War II years. I doubt there are many families today who would let a child travel that distance, unless the kid was buckled safely in a car. In contrast, my parents thought little of letting me hop on a one-speed bike and peddle to the lake where they were better off not knowing what I and the other kids did once freed of any adult supervision. Among other things, we tied ropes to tree limbs on the hill and then swung out over the water and back. If the weather was hot, we stripped to our skivvies, charged up the hill with the rope in hand, and swung out, letting go when we reached the highest point over the water. Needless to say (but I will say it anyway) this was an all-male show, part of the "little boys network." And then there was the story about my boat. I've heard boat owners say that the best day of their lives was the day they first sailed their boat. The next best day was when they got rid of the boat. The cautionary joke underlines the expense and time involved in boat ownership. I was lucky. I sailed and got rid of my boat on the same day. My pal Jack McManus and I built a small—I'd say five foot—row boat in his garage. Jack had one of the best Irish tenor voices I ever heard, but I soon discovered that boat building was not one of his talents. I can't recall how we got the boat to the lake, but once in the water it promptly sank as the two of us looked at each other in startled amazement. As far as I know, the little white skiff is still there. I will say this: the boat, which had a red stripe running around it, looked good even when it went to its grave, but so did the Titanic, which brings us back to ice. There was nothing amusing on the winter's day I saved a dog that fell through the ice when his young master tossed a stick and told him to fetch. The boy must have been very young because I can remember seeing him with fingers in his mouth, crying, pouring out enough tears to make me foolishly risk my life. I went out, got to where the dog was struggling to keep his head above water and quickly joined him, breaking through the ice, coming up and gulping air. My arms and his paws stretched out over the film of surrounding ice while our legs kicked frantically to keep afloat. To this day I remember that my first thought was one of relief. I was glad I didn't come up under the ice and been trapped. I guess it must have been due to all those World War II movies I saw, but I remember thinking I was in a safe foxhole, but, as my veteran Navy sailor relatives told me, there are no foxholes in the sea. Keeping one elbow on the ice, I grabbed the dog by the hair on his back and pushed him up to safety. That sounds heroic, but I did it mainly because his hind legs where starting to kick me. This dog was no Lassie. Instead of standing guard by the hole in the ice he dashed to the shore where he was reunited with his owner, who quickly ran off with him. There was a round of applause when I rescued the dog, a fairly good-sized animal who, I think, was at least part Shepherd. There was none when the dog made it to land. The boys, and a girl or two, looked straight at me with shocked stares when they realized I wasn't going to follow. "Help, help," I shouted as the panic grew and my weakening arms began slipping off the ice. "I can't get out! I can't get out! Get someone to help!!! Please, please!!!" I really thought I was going to die. I said some pleading prayers and suddenly on the shore was a teen-ager in boots, wearing a white T-shirt, jeans, and a black leather jacket—the standard issue clothing of a punk. Oh, God, I thought, he's a bully who's going to make fun of me. First impressions are seldom true. He had a rope he tossed toward me at least three times before it reached the perimeter of the hole and I pulled myself out. "You OK?" he asked when I reached safety. I answered "yes" and he said: "Don't do anything like that again, you stupid little s*** h***." He calmly coiled the rope and, with a flick of his head, motioned to the houses on the hill. "They'll help you," he said and walked out of my story and my life. I went up the hill to the nearest home, a Spanish-style tiled roof affair surrounded by a white wall about chest high, and knocked on the door which was answered by a red-haired stout woman of my mother's age who looked more puzzled than surprised, as if she was prepared for anything. I told her what happened and she ordered me out of my dripping jeans and shirt and into the bathtub. I was a bit hesitant. She said "I have two boys so I've seen everything" as I started to undress while the tub filled with welcoming warm water. Her calm demeanor quickly evaporated when she saw the scratches on my arms and stomach. I hadn't felt pain, just cold, so the finally-exposed bloody lines scared me. "You'll be just fine," the lady reassured me. "I'll phone your folks. You said you live on 45th. Clifford on 45th." She was right. I would be "just fine." My dad picked me up in about an hour. He said he was proud of my courage but told me "you've got to use your head as well as your heart." "The dog would have got out of there eventually," said Dad, who was from Montana and knew about ice and snow. "He'd start breaking the ice around him and make his way to shore. I saw it happen. It's what you should have done." My mother had little advice and no tears, just a lot of hugs and grateful offerings of "Thank God." 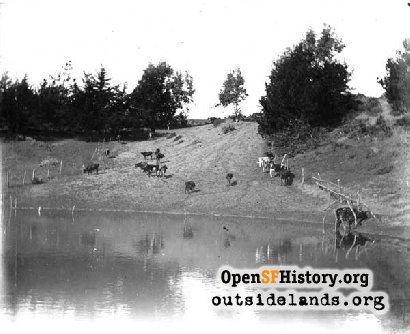 Cattle grazing alongside Pine Lake, often called Mud or Pig Lake, early 1900s., 1900 - Courtesy of a private collector. She said I should write a card to Mrs. Kenney, the lady whose home I had invaded. I did, of course, which would have been expected, even from an 11-year-old boy. What was not expected was a letter from her husband. He said he was impressed by how brave I was and asked me to join the Boy Scout Troop he headed, Troop 108. I did and had two of the happiest years of my life. One of the first things Mr. Kenney told me was that if I ever have to go out on ice again don't walk, crawl. That way your body weight is spread over a wider area. One reason my mother was less than overwhelmed was that she had been here before. When I was around five I slipped into the deep end at Sutro Baths and had to be pulled out by a lifeguard. I can still remember being on the bottom, trying to swim but only managing to walk, which stirred up the sand that lined the floor of the tank. I also remember marching down the water-soaked mats at the swimming palace to be met by Mom, clad in a pin-stripped suit, white blouse and huge hat, screaming "my baby, my baby" and blaming my brother, eight years my senior, for not watching out for me. One would assume that after these experiences I would never think it was safe to go back in the water, but I did. I went on to join the Sea Scouts and later the Navy. Some people never learn. 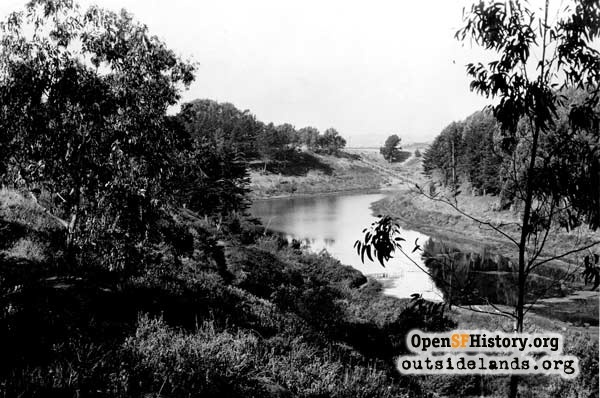 More on Pine Lake in an SF West History Minute. Page launched 15 September 2010.